Moms tend to have carry a heavy load. From the crack of dawn to the last light, a mom's job is never done. Still, during all those must complete tasks, moms need a few moments to themselves. Even just 30 minutes at the gym can restore her energy levels. But, the gym, whether on the treadmill or in the yoga studio, can cause a little embarrassment - bladder leakage. No woman wants down dog to come with a little piddle. Depend Silhouette Active Fit is the solution to any leakage embarrassment. Depend Silhouette Active Fit is discrete, thin, comfortable solution for women to experience bladder leakage. Even if you don't want to announce your situation to the world, bladder leakage is a common occurrence for 51 million women. Depend understands that you might want to hide that box of Silhouette Active Fit under a pile of paper towels, but you won't have to bury your gym physique under five layers of clothing. The biggest part of being active is to feel and look healthy. For some that means having a great physique. Previously, anyone with bladder leakage would have to ditch those yoga pants for big baggy sweats. I don't know about you, but big baggy pants are not a good idea for your yoga goddess pose. With the Depend Silhouette Active Fit, anyone can do down dog in her favorite yoga pants and no one will be the wiser. Depend Silhouette Active Fit briefs have a lower rise for an underwear like look, fit and feel. Available in black or beige, no one will know that you are wearing something different than regular underwear. The thin, moderate absorbency briefs allow women to be as active as they want without fearing the piddle. Over the years, I enjoy working out. No, I am not the super fit, zero body fat type of person (I like food too much). But, I enjoy my time at the gym. During those 60 minutes, no one can bother me. Whether I'm running away my frustration on the treadmill or calming my mind in yoga, the gym time is me time. After having kids, my body changed in a way that no one told me. Running is great, but that wasn't sweat down there. Who knew that those "other" muscles would be weak and not hold up during a long, strenuous run. Even in all black running pants, no one wants to have a noticeable problem. In learning about Depend Silhouette Active Fit and the Depend program of Underwareness. Did you know that there are more women under 50 who have bladder leakage than women who are over 60? The three year campaign that Depend launched on Underwareness is to stop the embarrassment about bladder leakage. As part of the Underwareness campaign, Depend encourages people to show their support for women with bladder leakage. For every photo and video shared using #Underwareness and featuring Depend products, the Depend brand will donate $1, up to $3 million, through 2016 to fund charities that advance the research and education of bladder leakage. Do you think that you could benefit from some Depend Silhouette Active Fit? 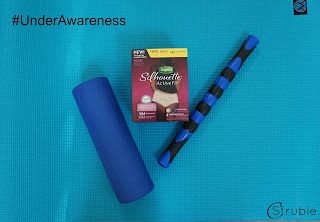 Visit www.Underwareness.com to support the cause and request free samples of Depend Silhouette Active Fit. Don't put your life on hold because of a little piddle. Join the Underwareness movement from Depend and rediscover your active self. Disclosure: I wrote this post as part of a campaign with Depend. I don't have to use these products yet, however my Mom does so I'm always on the lookout for products that work well for her so she can try them. I think the fact that these are becoming more user friendly are terrific! I mom is all about protection. After six kids dancing on her bladder she swears by her Depends. I don't believe age matters when it comes to leaky bladders. Younger women have that experience too. Depend products are a huge help! I am so glad that there are products like these available! They allow women to feel confident while still doing everything they love. I love that Depends has taken the needs of women into consideration. Undergarments have sure come along way! No more big and bulky products.